Starting February 1st, the Prostate Cancer Foundation (PCF) will kick-off a month-long TRUE Love contest that honors family and caregivers for their tireless work in caring for their loved ones living with prostate cancer. TRUE is a tribute to the unsung heroes – whether they are spouses, partners, nurses, doctors, siblings, children or friends. PCF will be accepting TRUE Love stories from all perspectives that reflect love, honor and care for prostate cancer patients throughout the Valentine’s season, when love is celebrated. 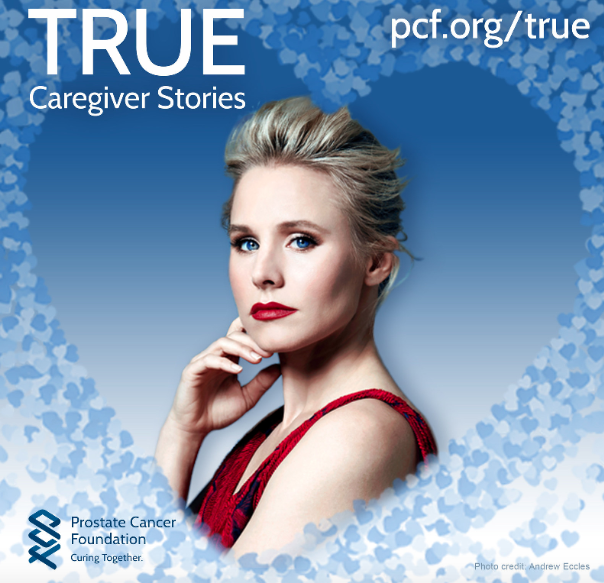 The most inspirational story will be announced by PCF on February 28th via social media and the winner will receive a special care package from award-winning actress Kristen Bell. Bell, known for her accomplished work in Veronica Mars, Frozen and Bad Moms, will be helping to create awareness about the TRUE Love contest and will also be curating a special gift for the winner with the most moving and heart-felt story. This cause hits close to home for Bell. Her mother is a nurse and her father-in-law is battling prostate cancer, so she understands first-hand the value of how caregivers are an essential part of a support system. How to submit: Simply visit www.PCF.org/true and upload a written story and photo portraying a unique caregiving situation. Select stories will be featured on PCF’s website. In the U.S, every 3.2 minutes, a man is diagnosed with prostate cancer. In 2018, 1.6 million men worldwide will be diagnosed and battling the disease. Fortunately, many patients have someone dedicated to supporting them through the battle and that support can make all the difference in the world to someone with a cancer diagnosis. From finding the right precision treatment, to recovery or palliative care, compassionate care is always possible and an essential factor in all aspects of care, especially while fighting prostate cancer.